First there were marshes; then there were dumps. The dumps were eventually turned into regulated landfills, and the landfills into shoreline parks. 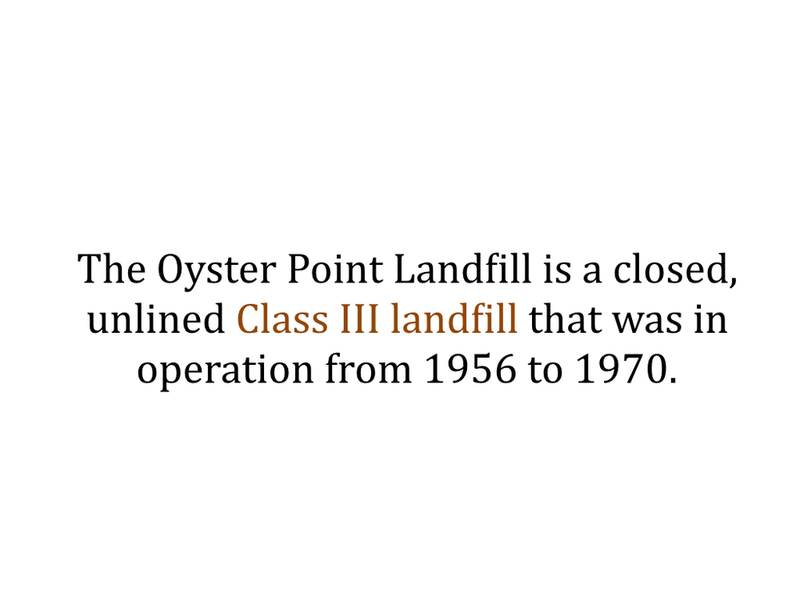 The Oyster Point Landfill is a closed, unlined Class III landfill that was in operation from 1956 to 1970. Prior to 1956, what would become the Oyster Point Landfill area consisted of tidal marshlands and upland soils and bedrock. Between 1956 and 1970, the City of South San Francisco leased the site (approximately 57 acres) to South San Francisco Scavenger Company. In 1956, Scavenger began disposal operations at the landfill. Initially, municipal solid waste was disposed of on the ground and burned. This activity ended in 1957 following the enactment of laws prohibiting open air burning of rubbish in the Bay Area. 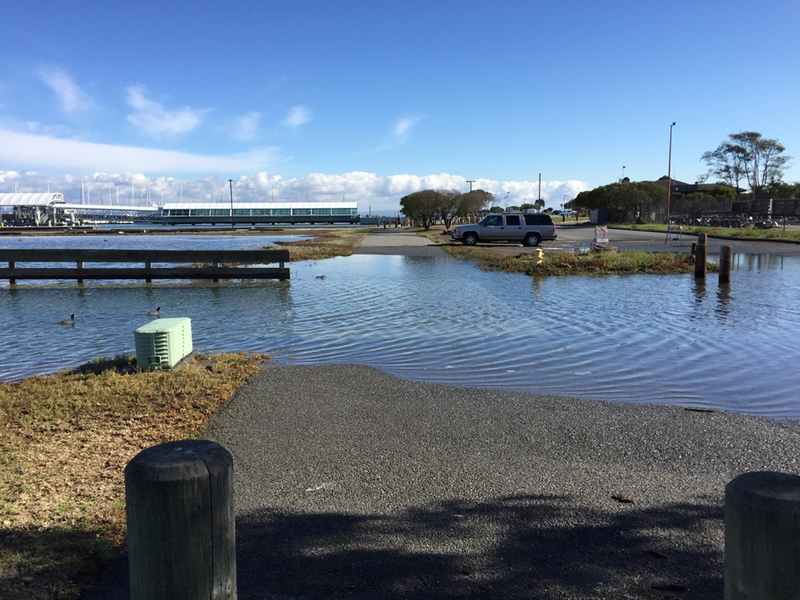 To address the new air quality restrictions South City and Scavenger established a solid waste disposal site on the submerged lands just east of the original Oyster Point. The landfill was developed in three phases. Filling of the first section began in 1957 and was completed by late 1961. The first area to be filled extended into the Bay about 1,500 feet eastward from the original bluff. 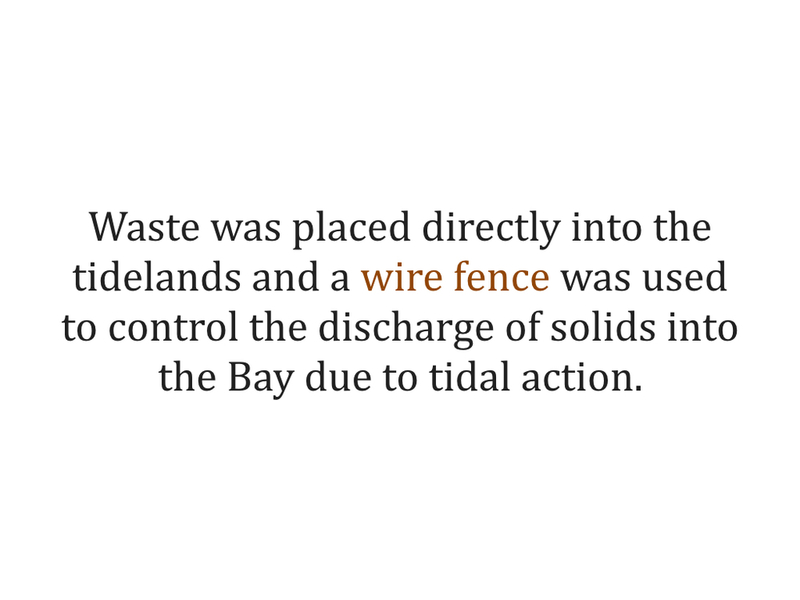 Scavenger placed waste directly into the tidelands and used a wire fence to control the discharge of solids into the Bay due to tidal action. Waste disposal operations eventually resulted in the relocation of the shoreline approximately 3,000 feet to the east of the pre-landfill shoreline. The landfill material consists of up to 45 feet of poorly compacted municipal and industrial waste. Typical waste found within the landfill includes the following: chemicals, drums, paper, cardboard, organic matter, wood, glass, metal, rubber, rocks, concrete, and other materials. The base of the landfill material has been compressed into, and mixed with, the upper part of the Bay Mud. The volume of waste in the landfill is approximately 2.5 million cubic yards and total tonnage of this material is approximately 1.4 million tons. 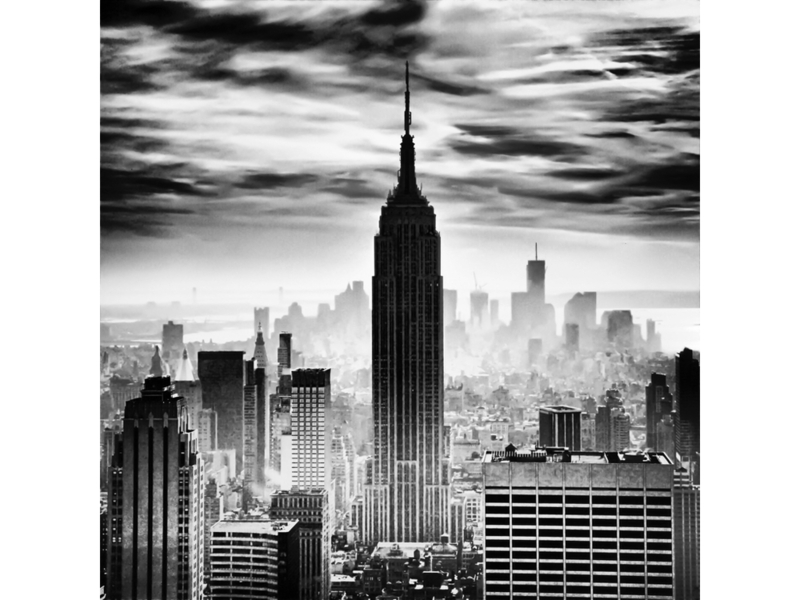 This volume of waste would cover a football field almost to the height of the Empire State Building. Beginning in 1961, the landfill received liquid industrial waste for disposal. The types of liquid waste included paints, thinners, and coagulated solvent sludge. The liquid wastes were placed in a sump (Sump 1). No records describing the construction of the sump have been found. Liquid industrial wastes were disposed of in this sump from 1961 until 1966. In July 1966, the City of South San Francisco discontinued the use of Sump 1 and used Sump 2 until 1967. The total volume of liquid industrial waste received by the landfill in 1965 and 1966 is estimated at 608,351 and 378,680 gallons, respectively. 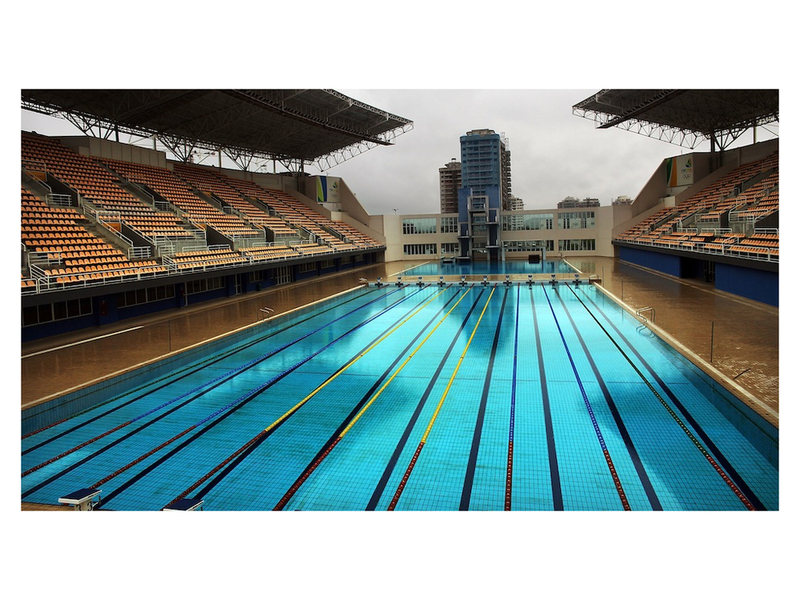 Sump 1 alone is almost enough to fill an Olympic-size swimming pool. 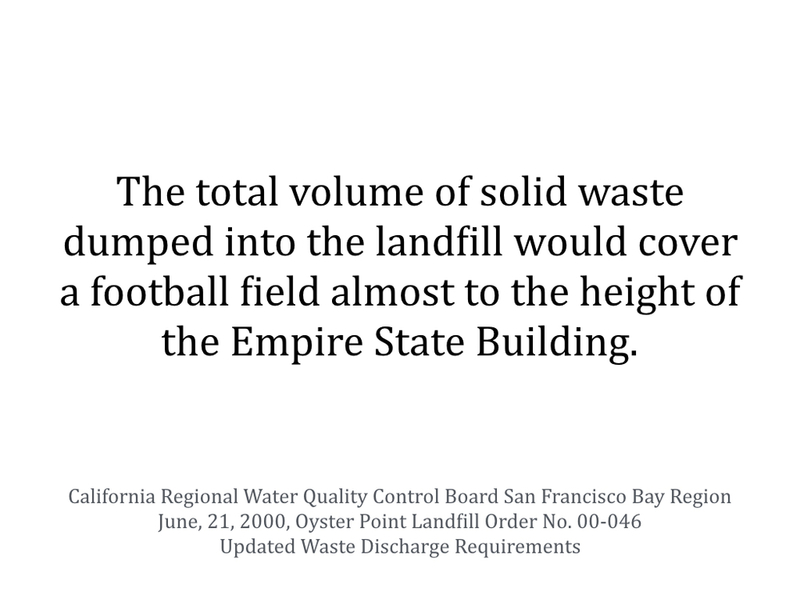 Consistent with landfill practices at that time, no liner was installed at the site. Waste disposal design features such as liners, cellular division of waste, and leachate collection systems were not installed. 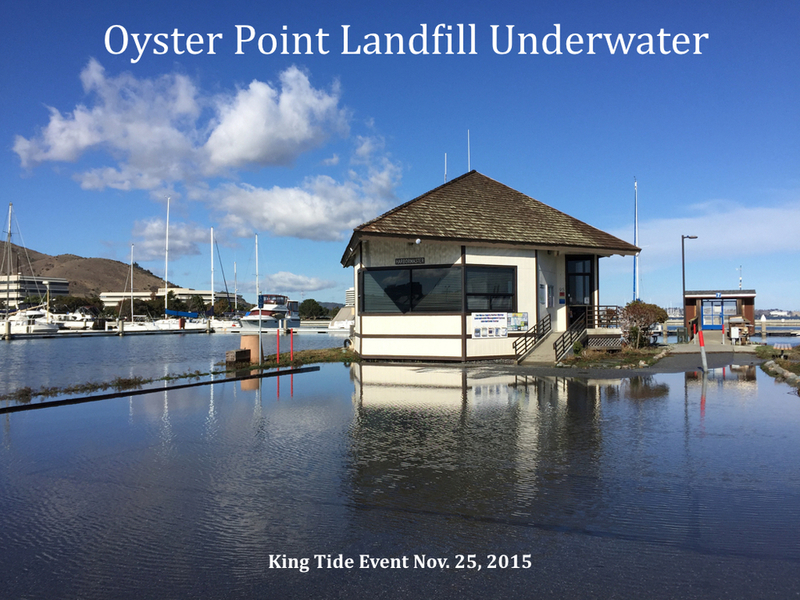 Instead, the waste materials were placed directly onto the Bay Mud and soils overlying bedrock. 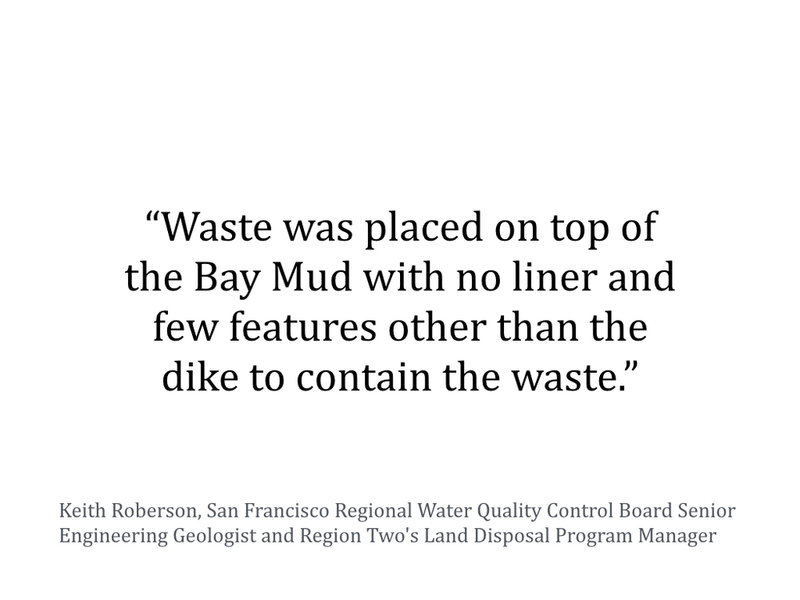 In order to contain the solid waste from contact with waters of the State, Bay Mud berms were constructed around portions of the waste disposal areas in 1961, 1962, and 1964. However, there is no data to suggest that the industrial waste sumps were ever constructed with additional berms or dikes to control the migration of liquid wastes. 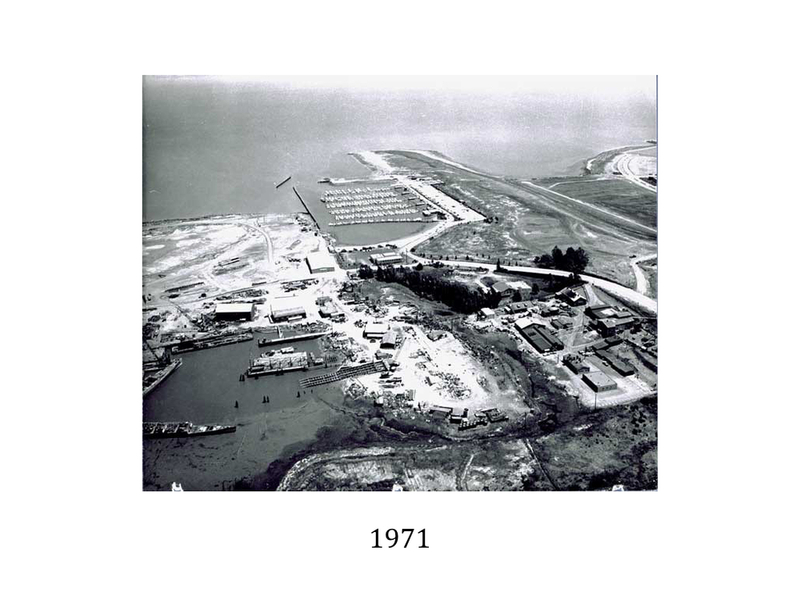 In 1962, a small craft harbor was constructed along the north shore of the landfill. To create a breakwater for the east side of the marina, the second phase of landfill was placed in the form of a mole extending from the eastern end of the first fill and north about 400 feet into the Bay. The third phase of filling began in 1964 and was accomplished by dredging up Bay Mud and forming mud dikes and a dike-enclosed cell in which solid waste was later placed. Upon completion of the disposal operations, various landfill closure activities took place through the late 1980s. 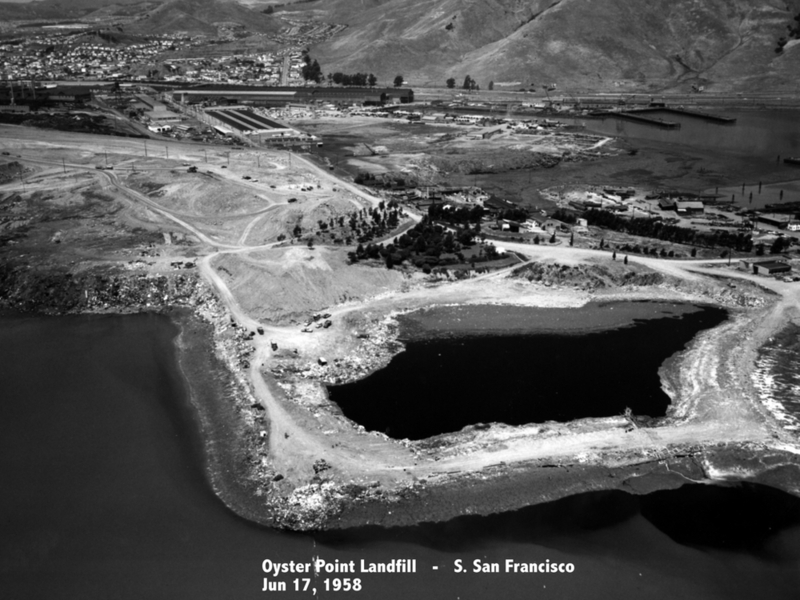 The closed landfill then became the site for development of the Oyster Point Marina/Park. 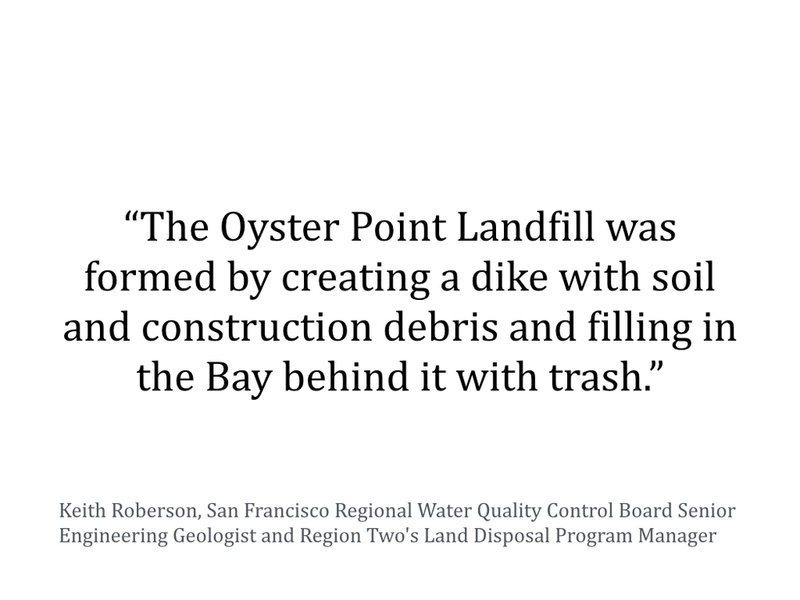 The landfill is currently owned by the City of South San Francisco and is operated as a marina, ferry terminal, yacht club, hotel, office space, and open space. 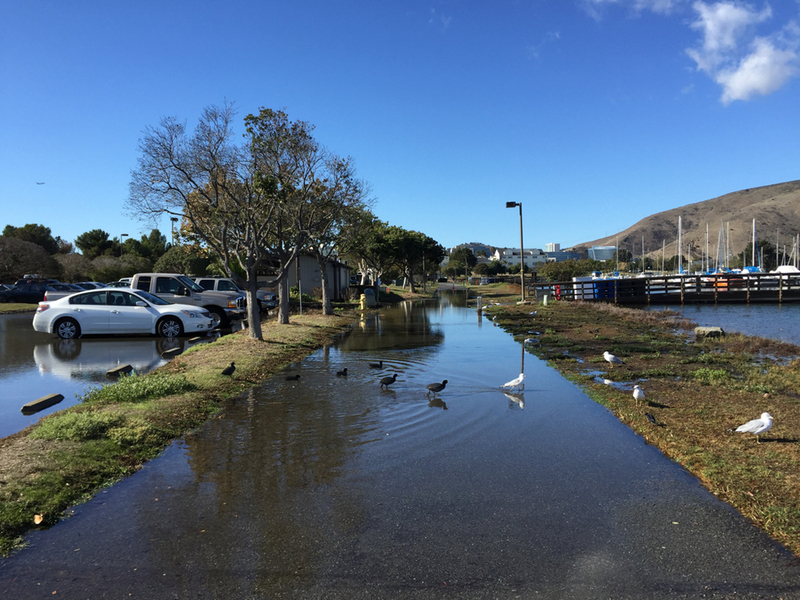 South City is responsible for landfill maintenance and the San Mateo County Harbor District manages marina operations pursuant to a Joint Powers Agreement that terminates in 2026. South City hopes to redevelop the site. 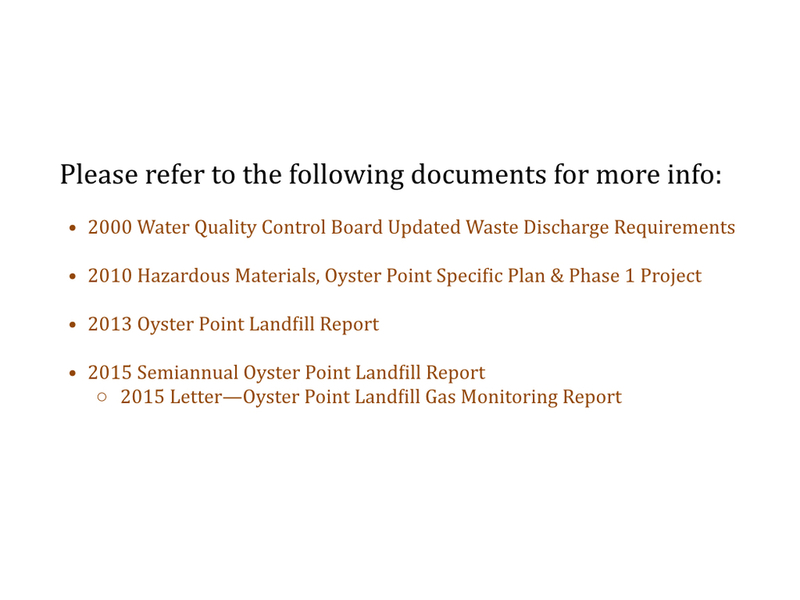 The 2015 Semiannual Oyster Point Landfill Report states that a project would include excavation of landfill materials at the former Oyster Point Landfill and relocation of these materials on- and/or off-site. 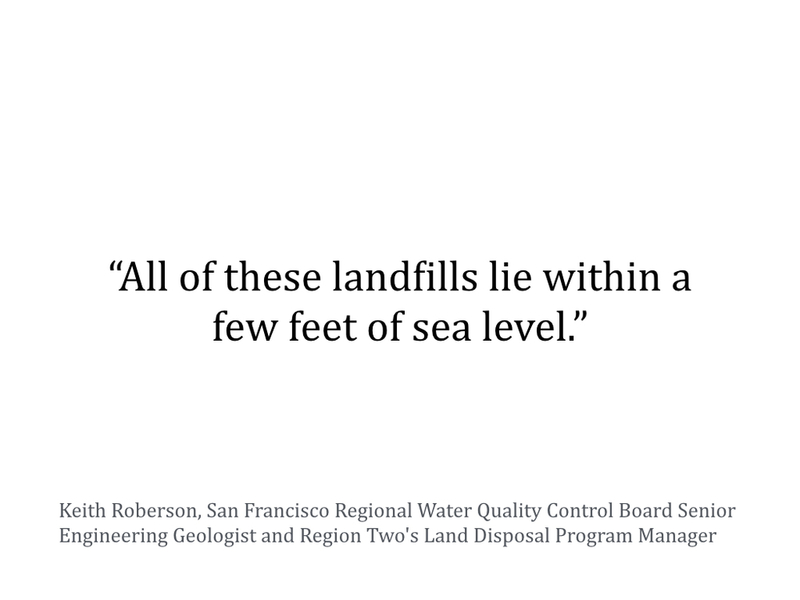 The landfill cap would be upgraded to meet the current requirements of Title 27 of the California Code of Regulations with the approval of the Regional Water Quality Control Board and San Mateo County Environmental Health Division. The first phase of redevelopment plans call for up to 600,000 square feet of office/R&D space, envisioned as a biotech campus, and possibly a retail/restaurant building, in the area currently occupied by the existing commercial development at the eastern side of the landfill site. Phase I also includes the reconfiguration of Marina Boulevard and a portion of Oyster Point Boulevard, and a shuttle turn-around will be constructed adjacent to the Ferry Terminal. 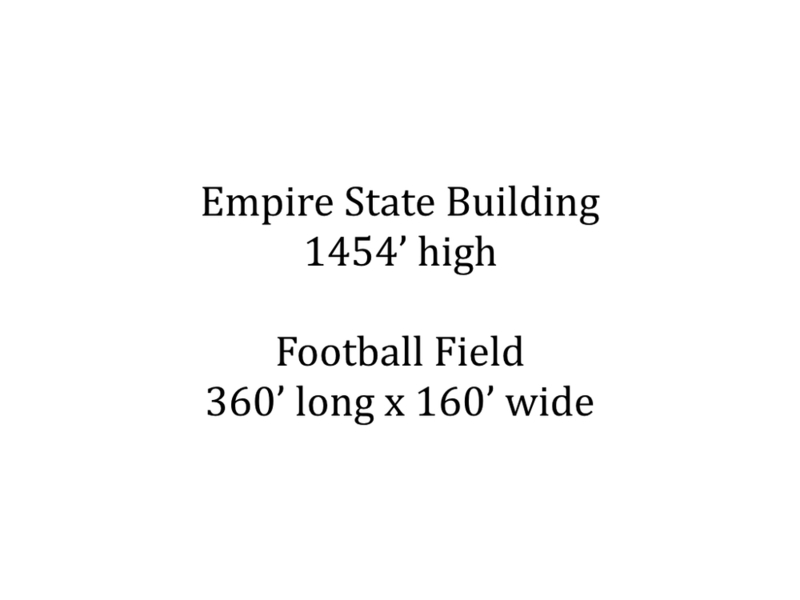 Parcels to the east of the new development will be graded and improved as sports fields. Further east a future hotel and retail complex is envisioned. The existing Yacht Club structure and the Harbor District maintenance building would remain. Where is the wisdom in developing such a risky site? 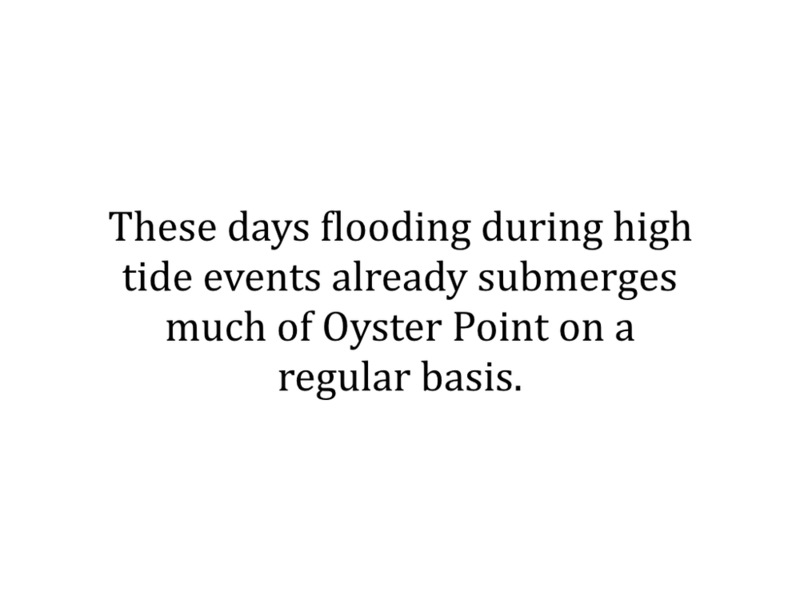 Health, safety, and public access concerns include flooding from landfill subsidence and sea-level rise, Bay saltwater breaching the landfill cap, underground electrical saltwater intrusion, gas explosions, and liquefaction. 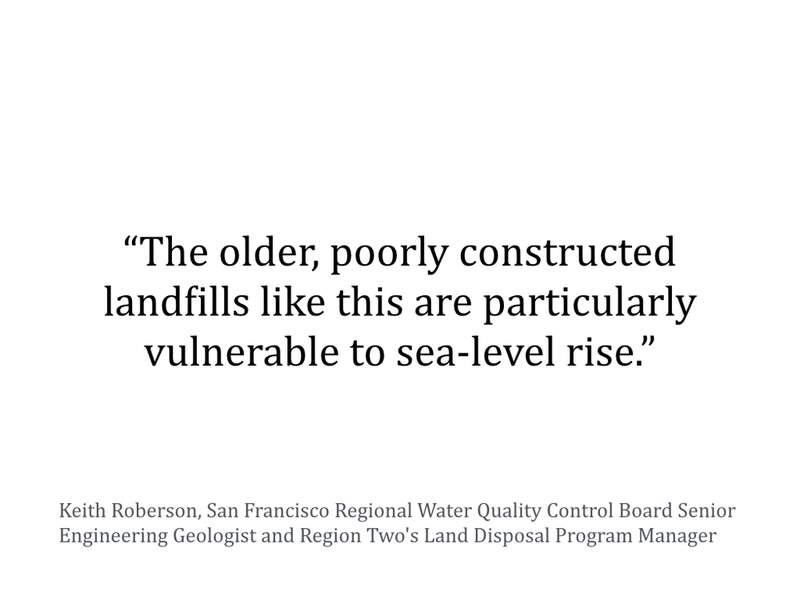 On Dec. 9, 2015, Bruce H. Wolfe, Executive Officer of the San Francisco Bay Regional Water Quality Control Board sent the City of South San Francisco an enforcement letter regarding recurrent flooding overtopping the landfill cap. 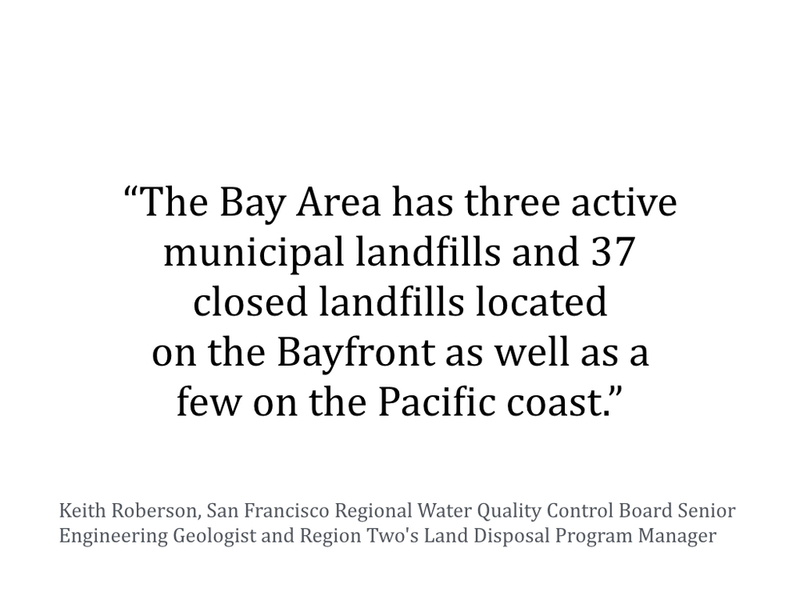 The San Francisco Regional Water Quality Control Board, San Mateo County Division of Environmental Health, and Bay Area Air Quality Management District are the agencies that regulate the landfill. 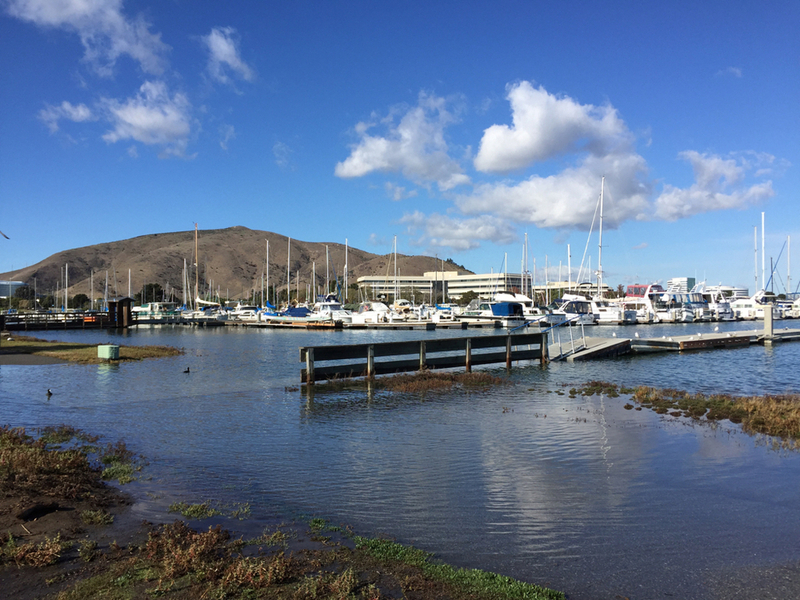 Feb 26, 2016 — City of South San Francisco short-term plan for mitigating flooding at Oyster Point Marina caused by landfill subsidence and sea level rise. See Figure 5 in the Report. It appears that sea-level rise projections have not been calculated or included in the topographical mapping yet.